I’m not exactly a brunch person, but when I’m visiting somewhere, I happily become one. 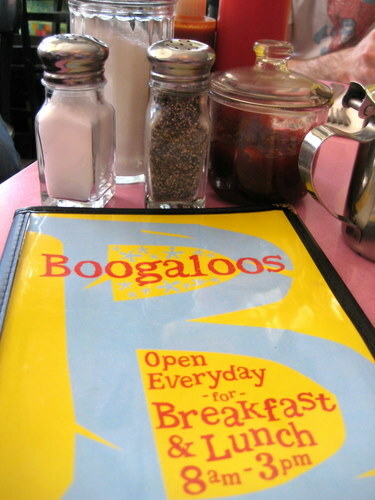 After trying several times on previous visits to get brunch at Boogaloos on a weekend, I decided that the weekday was the way to go. So on a Friday during prime lunch time, we gave it a shot. Well, there was still a wait, but it was really nice and short. Finally, success! The inside is just absolutely crazy. There’s odd art on the walls, truly odd. But you don’t go there for the decor. J got the Zydeco Breakfast, which was 2 eggs served with spicy andouille sausage, black beans, fresh salsa, sour cream, cabbage salad, and a corn muffin. He substituted the chicken apple sausage for the andouille. I went with the Polenta-n-eggs. 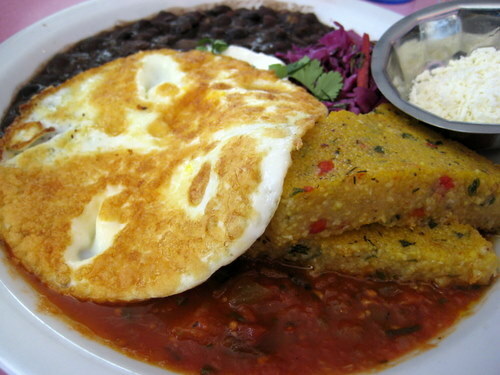 Like its name suggests, it is two sizeable hunks of grilled polenta with a salsa ranchero, served with 2 eggs, black beans, sour cream, and cabbage salad. Everything on both of these dishes was fantastic! And the food came out amazingly fast! I loved my beans and the zesty cabbage salad. 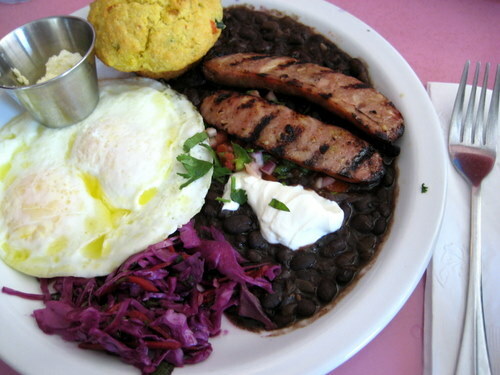 The salsa ranchero was warm and went with everything, including the eggs and the polenta. If you love polenta in general, you will especially enjoy this version. The chicken-apple sausage was also great, and really, it doesn’t taste chicken-y or apple-y, it just tastes like straight up breakfast sausage, but is theoretically better for you. And we both loved the corn muffin. This one had some extra stuff in it, like jalapenos and other spices, and wasn’t really spicy at all, just good. Now I can see why this place is so popular. Once you get in, you get tons of tasty food really quickly. And the prices are quite reasonable.